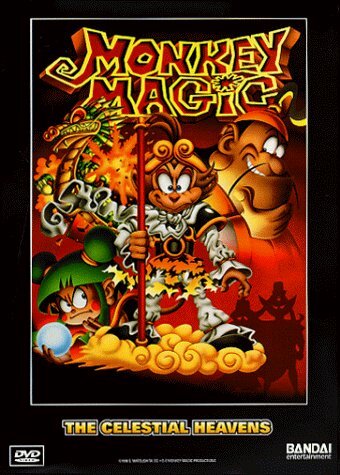 Monkey Magic (much like Dragon Ball and Saiyuki) is another retelling of the classic fable "Journey to the West." This is the story of Stone Monkey, a warrior who falls from the sky and comes to life after living in stone. The world he inhabits is threatened by the evil of Dearth Void, who is the ruler of the Dark Side of the Universe. However, Stone Monkey is strong and very ambitious. He becomes the leader of a clan of monkeys and plots to become powerful enough to challenge the Celestial Heavens themselves. (Especially after he develops an intense rivalry with Prince Nata.) Stone Monkey's powers build and he eventually changes his name to Kongo, but is Kongo becoming too powerful and ambitious for his own good? As he fights, it becomes apparent that he has a lot to learn when it comes to brandishing power. But will he put it to good use and put an end to the manipulating threat of Dearth Void?